12.15.11: Time Out New York names "The Man With F.E.E.E.T." in their "Best of Comedy 2011" feature! 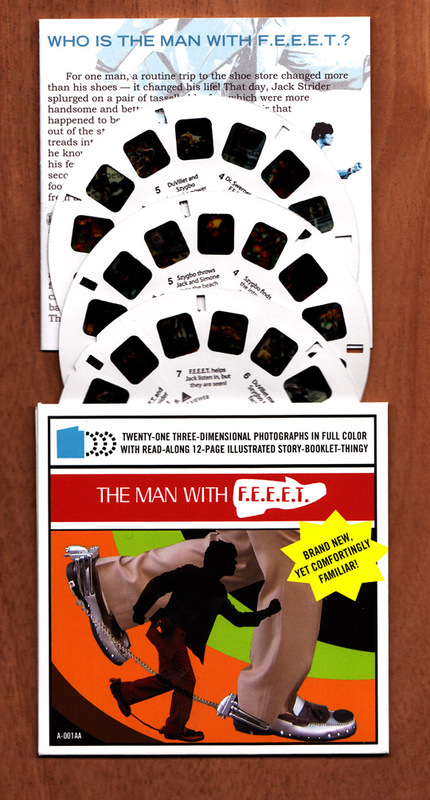 1.3.11: The Man with F.E.E.E.T. 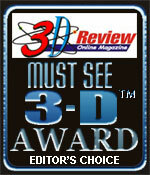 given "Must-See 3D" award from 3-D Review Online magazine! Now available! 20-minute view-along soundtrack featuring the cast and narrated by TV's JOHN HODGMAN. Purchase the View-Master reels and download the soundtrack >>here. The Man With F.E.E.E.T. is a brand new comedic adventure for View-Master viewers from Eric Drysdale, >>available now. It features twenty-one three-dimensional photographs on three View-Master reels, accompanied by a read-along sixteen-page story-booklet-thingy. In the reels, Christian Finnegan stars as Jack Strider, the ordinary man called to extraordinary action when he becomes steward to the most powerful pair of loafers in the world -- known as F.E.E.E.T. (Footwear-based Electronically Engineered Emulation Technology.) In this story based on the fake episode of the made-up mid-'70s-ish TV show, handsome Jack Strider and his amazing compu-electronic shoes catch the trail of a crooked beach ball manufacturing mogul. The adventure leads the team to a deadly confrontation with a dangerous international weapons smuggler with whom Jack has tangled before! Lucky collectors will notice that this now-available first edition has an 'error' on the sturdy outer reel envelope. The copy underestimates the thrills inside by 4 whole pages of story booklet!